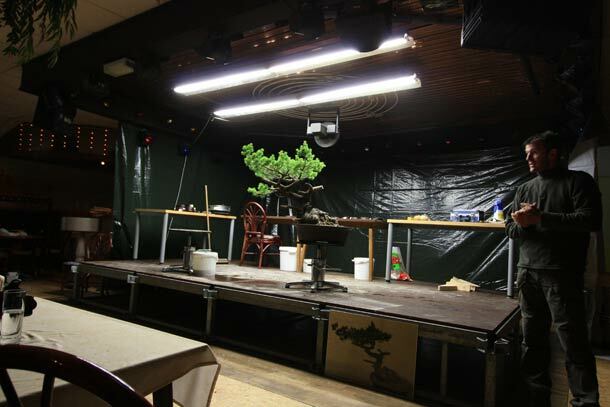 Here is the Pine tree prior to being worked on by Abe Kenichi at t’Veerle Japanese Bonsai Centre in Belgium. 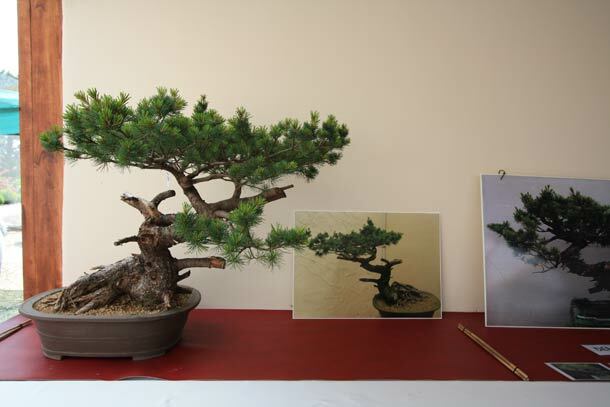 The initial discussion on the Pine during the start of the workshop was firstly carrying out an assessment of the tree prior to working on it and deciding on the front, and in the photograph above, the tree was being showed from a back view, while the image within the photograph was considered the front view. 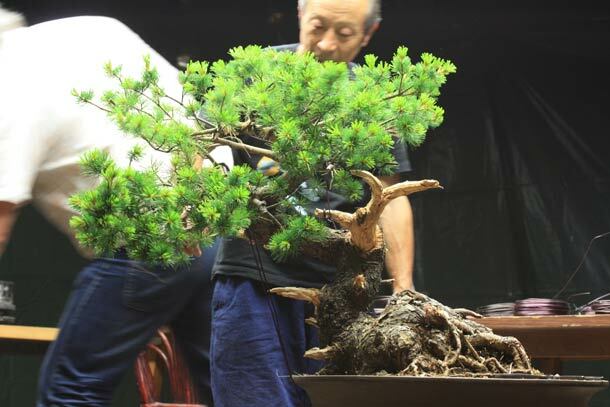 The trunk of the Pine was very impressive and had a great sense of maturity and age already but some of the stub ends were currently very straight. The branches appeared to have a good level of flex in them with a good density of healthy foliage across the crown. 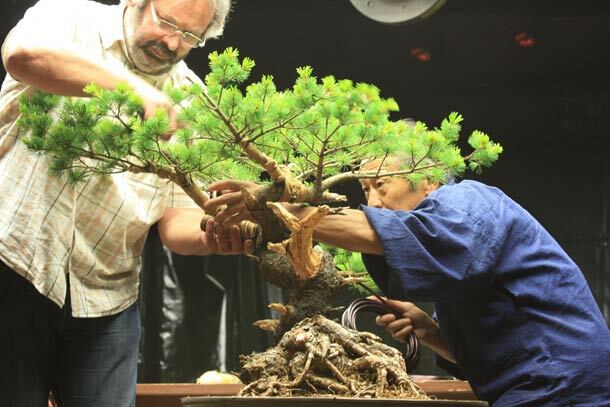 Once deciding on the front, Abe Kenichi then talked about the need to emulate nature when styling for bonsai, and he showed an example of a picture of a pine in nature with fantastic gnarled stubs that had formed over time by natural elements. 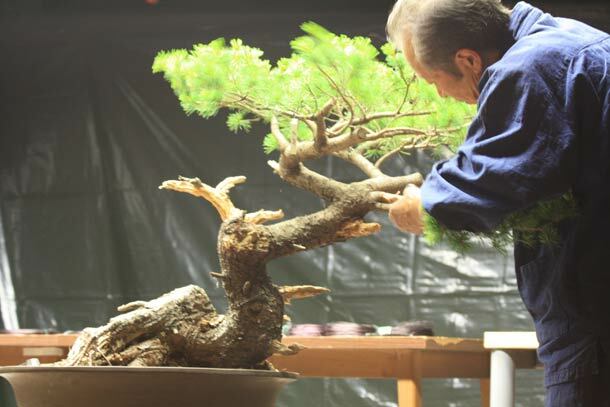 He then went on to remove unwanted foliage and start to prune the longer laterals to start to create an overall more compact form. 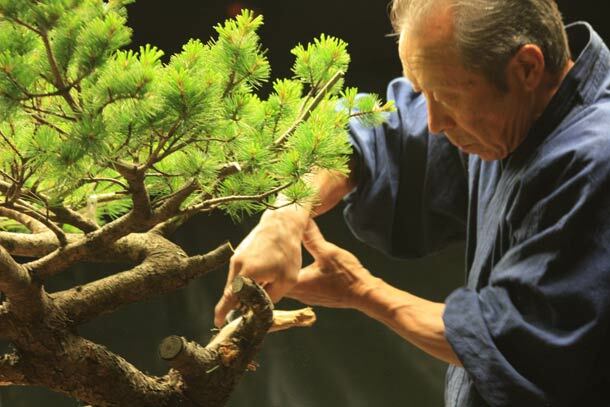 Once the excess foliage was removed, Abe Kenichi then started to firstly saw the length of the cut stubs back and then proceeded to strip the bark off the branch stubs that were just cut stumps and started to jin these using a range of hand tools. 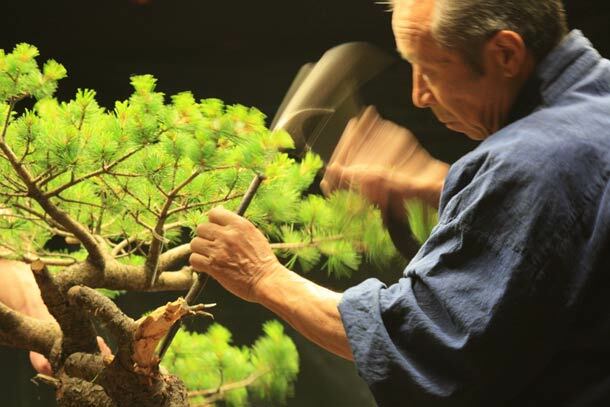 He used a hammer and chisel as well as bark stripping pliers and other cutters to skilfully carve out interesting shapes and forms to the jins. After all the stubs were worked on initially, then the wet raffia came out, this was useful to watch the technique firstly in how they made the bands of raffia from tying multiple separate strands together and soaking them. 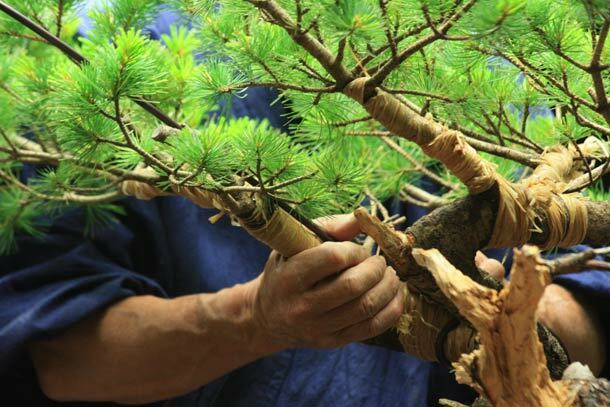 To the dividing the strands into two and looping them around the trunk and treading the divided strands back through to create a hold on the branch to initially tie the raffia to the branch. 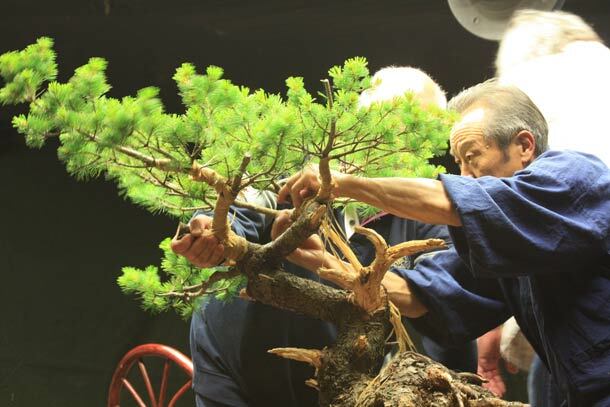 It was then wrapped around the branches in turn and any untidy ends were then cut to create a clean branch line. 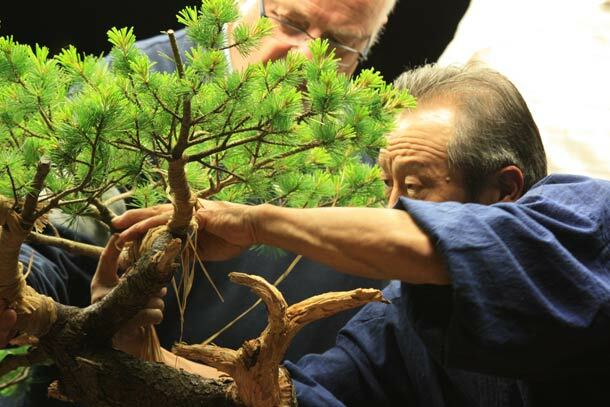 Once the raffia was applied, the fun started with the application of firstly a straight wire along the length of the branch which was then anchored around the tree or another branch and then double backed over the straight wire to hold the straight wire along the branch in situ. This was at least a two person operation with the need for many hands. 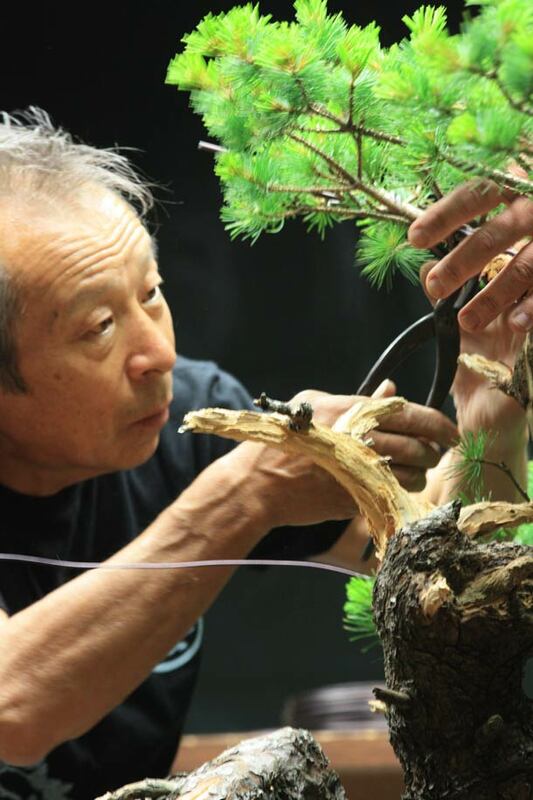 This was the end result after the initial pruning, jin creation, application of raffia to the branches and then wiring. 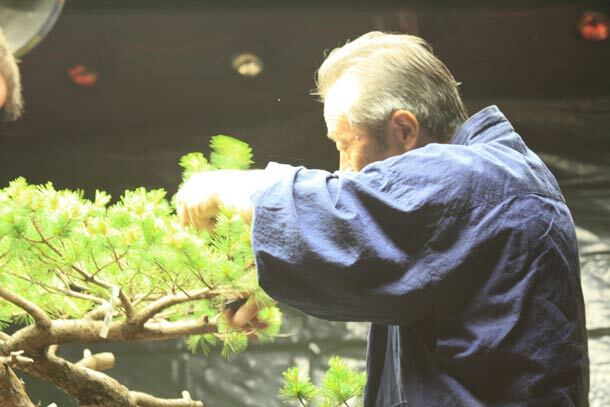 Following this the real strength was required as the branch bending and styling now came into action. 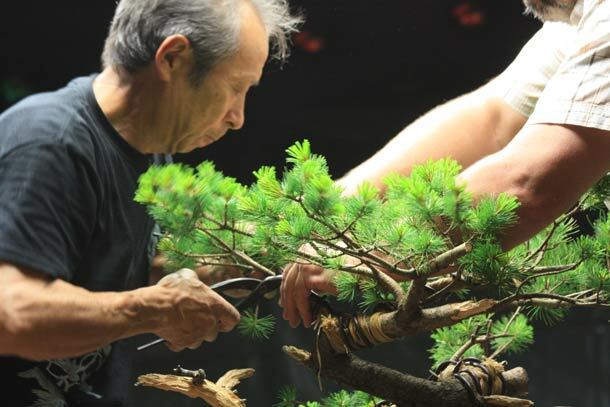 The branch was pushed down upon by one pair of hand while Abe Kenichi then used wire to secure the branch in place via the use of guys. 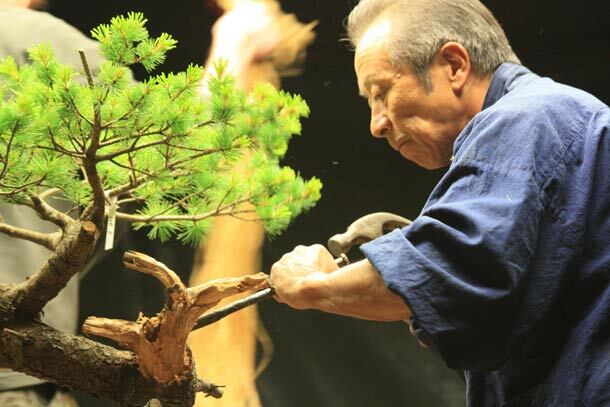 He attached the other end of the wire to that of one of the jins he had created to form an anchor point and while the pressure was applied to lower the branch into position he tightened the wire guy by twisting the wire. 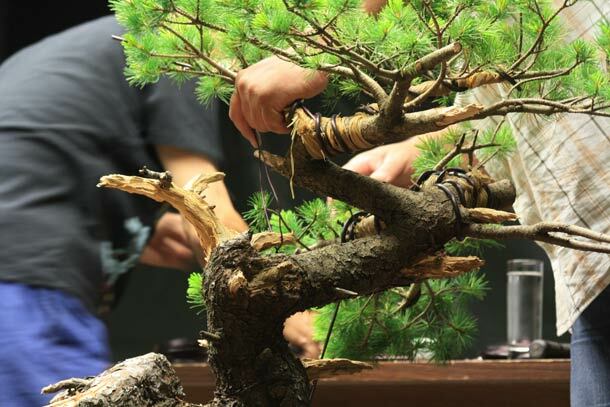 This took a significant amount of care and strength in order not to damage the branches in the process as well as to ensure that the branch was then positioned correctly. 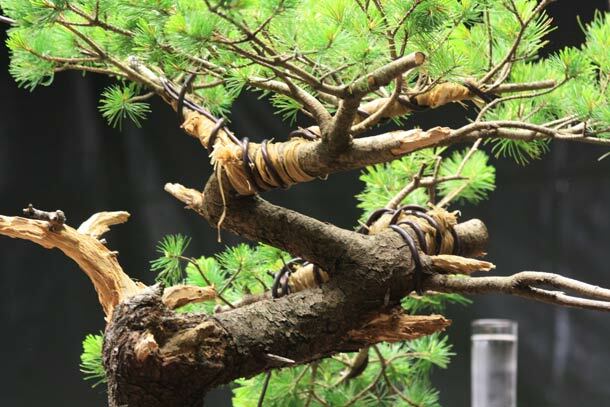 The straight wire running along the branch that was being bent gave it additional support and the wire was then gently pushed into the top side of the branch to cover over and cracks that may have formed under the raffia. 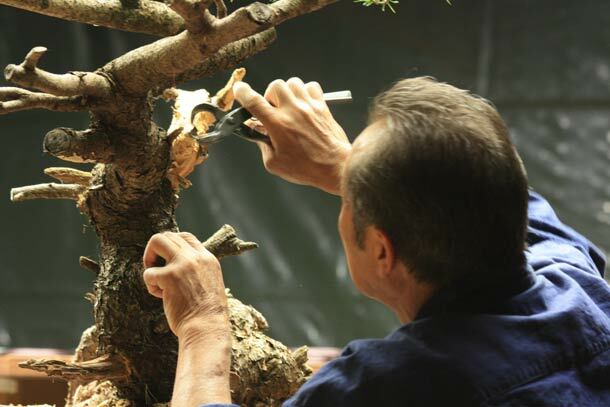 Cut paste was also applied at this stage to any open cracks which were exposed from the bending process to seal in the moisture of the exposed cambium layer on the branch. 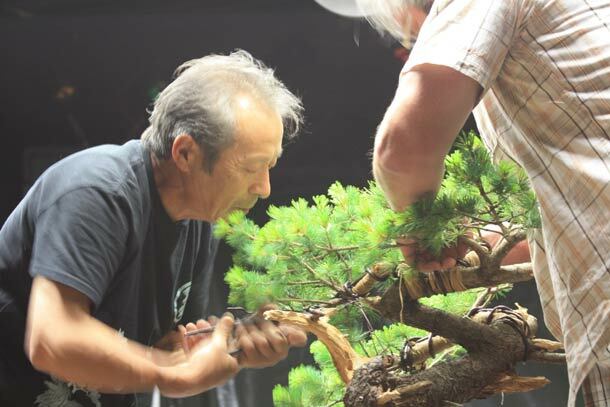 This process was then replicated on other branches as part of the styling process for the whole tree and each branch was worked on in turn. 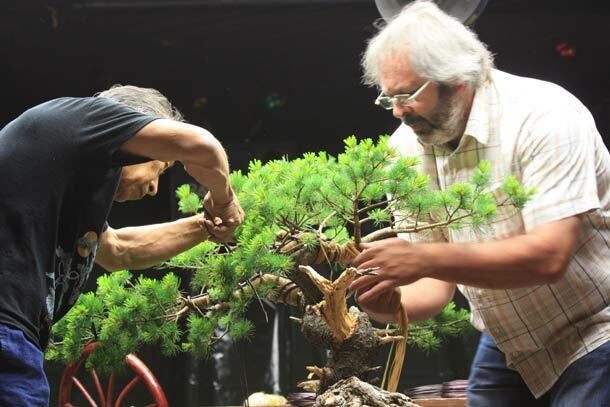 This is unfortunately where we left the demonstration as we had to catch the train home, but we look forward to following the progress of this Pine tree and will keep a watch on the t’Veerle website for an update of the finalised styling from that day. 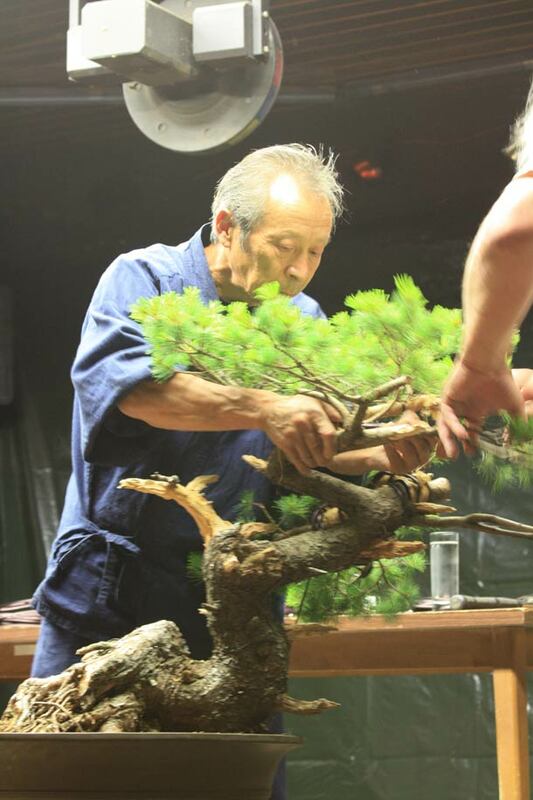 It was a great demonstration to watch by a leading Pine Master and we learnt a lot just from watching all the techniques being applied in this process of styling. Posted June 8, 2012 by AW & filed under General Interest.